The 37-year-old Briton won 28 and lost four of his 32 fights since turning professional in 2002 and his last defeat came in a rematch against compatriot Tony Bellew last month. "Today I announce my retirement from professional boxing. They say you can't play boxing. 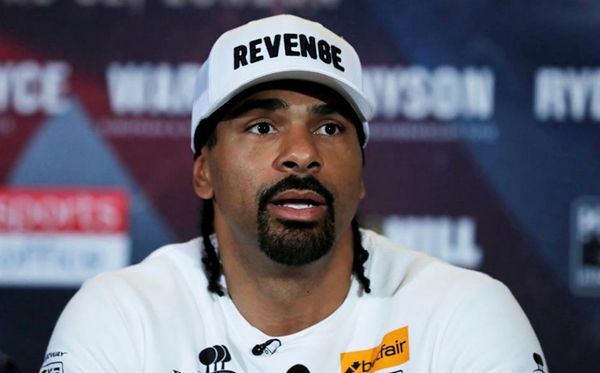 Yet, as I write this retirement statement, and reflect on my time in the sport, I can't find a better way to describe the ride... ," Haye said in a statement on his website. "In the first eight years, everything ran smoothly. I had 25 fights and became the first ever British boxer to unify the cruiserweight division (WBA, WBC and WBO World Championships)," the Londoner added. Haye went on to beat John Ruiz and Audley Harrison before facing Wladimir Klitschko in a unification fight in 2011, where he was criticized for his pre-fight antics before losing on a points decision. "In the past five years I have snapped both biceps, my rotator cuff and my Achilles tendon. All four injuries were potentially career-ending and each of them required operations with months of intense rehabilitation," he said. Haye lost to Bellew for the second time last month. "Since October 1990, I have been a boxer. That's nearly 10,000 days of eating and sleeping boxing, and now I'm ready to close this chapter in my life," Haye said. "This is not the end of my story. It's simply the start of something new." Meanwhile, American Deontay Wilder has agreed terms to fight Anthony Joshua in Britain later this year in a bout that would crown the first undisputed heavyweight champion since 2000, ESPN reported on Monday. Wilder's co-manager Shelly Finkel told ESPN they had agreed to the latest terms offered by Joshua's promoter Eddie Hearn. "We have agreed to the terms that Eddie has put out to us for a fight in the UK. Deontay has accepted his terms to fight in the UK.," Finkel said. Wilder, in a message posted on his Twitter account, confirmed he had agreed to fight in Britain but said an offer to Joshua of US$50 million to fight in the United States was still on the table. "Today I even agreed to their offer to fight Joshua next in the UK. If he prefers the fight in the UK, the ball is in their court." The WBC title is the only one remaining on Joshua's radar after he added the WBO championship to his collection by defeating New Zealand's previously unbeaten Joseph Parker in March by unanimous decision.